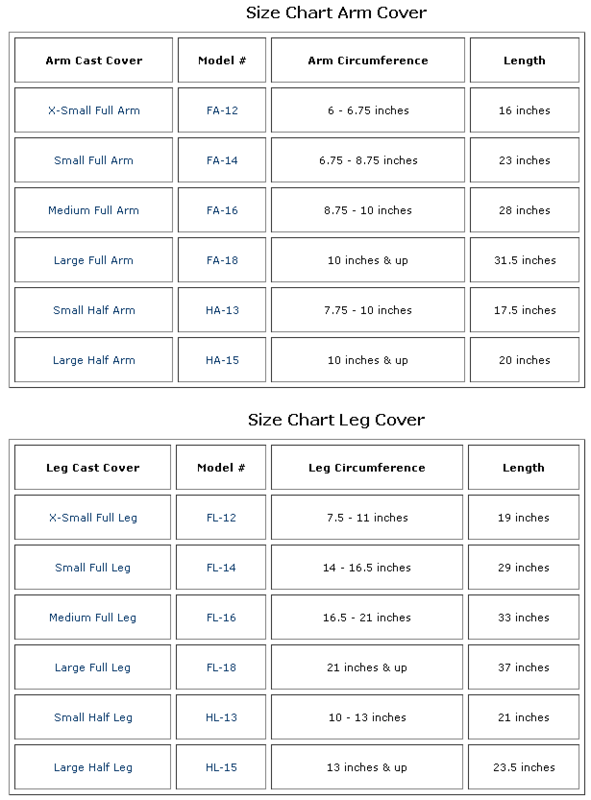 X-Small FULL LEG - 19 Inch Length, 7.5 to 11 Inch Circumference - SHIPS FREE! Small FULL LEG - 29 Inch Length, 14 to 16.5 Inch Circumference - SHIPS FREE! Medium FULL LEG - 33 Inch Length, 16.5 to 21 Inch Circumference - SHIPS FREE! 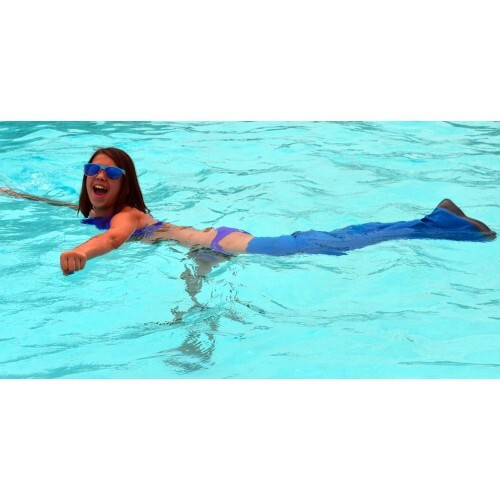 Large FULL LEG - 37 Inch Length, 21 Inch and Up Circumference - SHIPS FREE! Small HALF LEG - 21 Inch Length, 10 to 13 Inch Circumference - SHIPS FREE! Large HALF LEG - 23.5 Inch Length, 13 Inch and Up Circumference - SHIPS FREE! 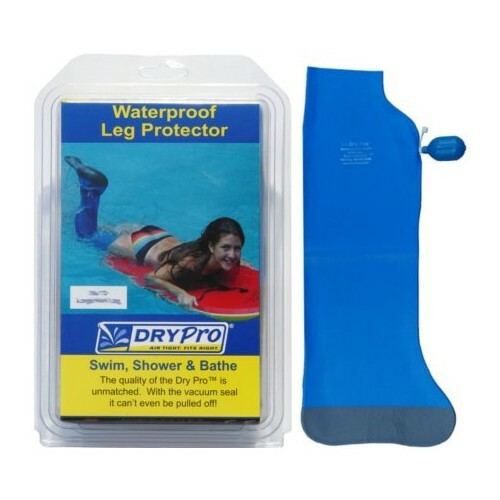 The Dry Pro Waterproof Leg Cast Protector is 100% watertight and keeps your bandages, prosthesis and casts dry while you enjoy any number of activities in the water. With a patented vacuum seal, this waterproof cast protector is equipped with a convenient bulb pump operation that effectively suctions and seals airtight, water-proof space. The unparalleled waterproof sealing action keeps casts completely dry while you dive off of diving boards, ride ocean waves or simply relax in the bath or shower after a long day. The Dry Pro Cast Protector offers full protection during a shower, bath or even an active swim. Unlike other ill-fitting products, the Dry Pro leg cover is simply unmatched; the airtight seal is completely slip proof, water proof and cannot be pulled off. 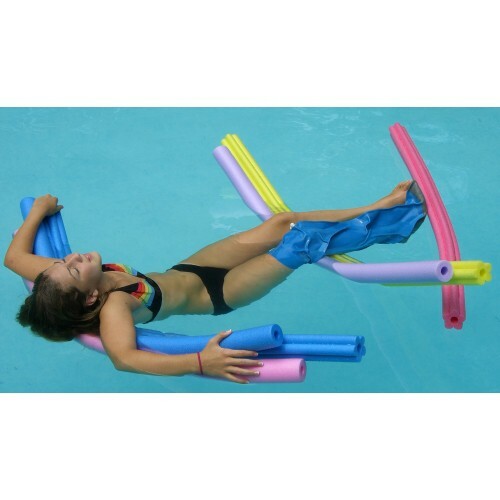 Don't let your cast inhibit the water activities you enjoy - this waterproof cover is the ideal take-along item for any vacation, family get-together or hot summer day at the pool. 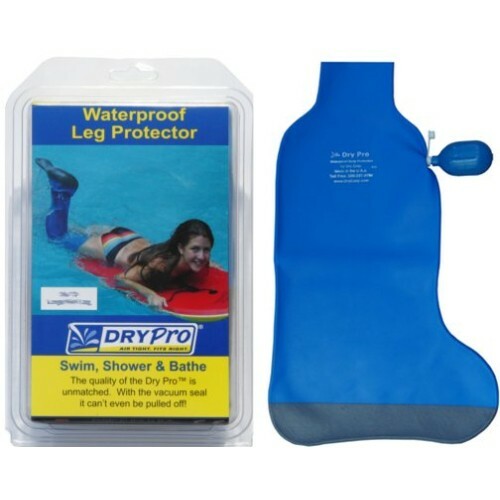 You may also be interested in the Dry Pro Arm Cast Protector, or the Dry Pro PICC Line Waterproof Cover. Typically you'll want to wait until the wrap dries before putting it back on to re-enter the water. I have a medical boot on. Was wondering if I can use this over the bootcast? This leaves enough room around the leg to form a tight seal around the boot cast without having to worry about the material being cut open. 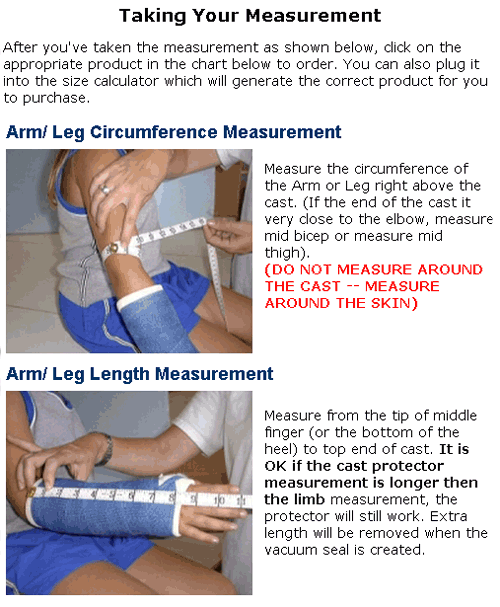 When sizing the boot should we measure the circumference of the cast? The manufacturer suggests measuring at the widest part of the cast, if possible. I have a half air cast adult medium, what size would you recommend. Can it be used in a hot tub? It is not recommended that this item be used in a hot tub. With a unna boot, your toes are the only part exposed. How does the dry cast protector cover your foot? There is a closure on the other end of the cover that keeps the foot from getting moisture inside. Instead of a cast - I was trying to cover a wrapped cast. The size large Dry Pro did not go over the wrap - two of us tried to stretch it over the wrap got so far and decided against it. As we tried to remove it off the wrap - the wrap stated to come off. I like how it keeps out all the water when in the tub. This is helping, but I wish that it came in a shorter version. In order to find the one that fit my circumference, I had to take the one that proved to be about 1-2" too short to get a good vacuum. I had to add a piece of material that was similar in order to get the right length. It is no longer "easy on", but it does work. This product has given me the freedom to shower by myself again. My wife always had to help me before. The product works as advertised. The only small issue is the very top of my cast gets slightly damp. I'm not sure is this is from presperation or not. Other than that, it allows me to sit in my shower chair and relax with no worry about my cast getting wet. I had heard about this product from a friend and it really works very well. Great product. Had foot surgery and was not able to get my foot wet. The Cast Protector worked great keeping my foot dry while I showered. Only problem was that it became very slippery when wet and had to take precautions to keep from falling. It fits well and works well. My cast stays dry through my whole shower. I didn't even have to cut the cast cover to make it fit.. it fit correctly as is. Showering with a cast on your leg is difficult enough. Taking the worry of ruining the cast with water as you enjoy a hot shower is wonderful. Having gone thru a few different versions of the same old "plastic bag with some kind of clincher or adhesion", with no success, I found this item and ordered immediately. Well worth the money if you're going to have anything on your body that must stay dry. Works just like you would hope. Haven't tried swimming yet, but have heard from others that it's just as good for that too.